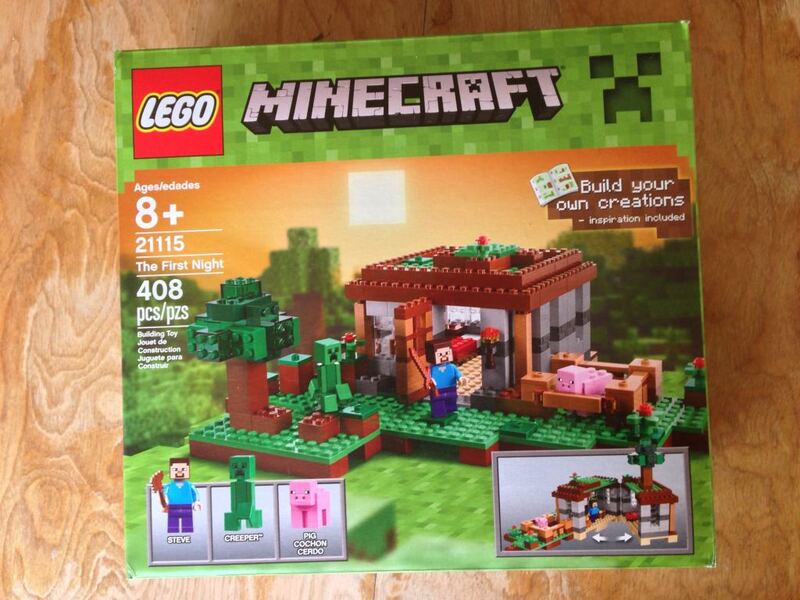 I’ve been on the fence for a while about the Lego Minecraft sets. The Micro World sets are practically parts packs for microscale builders and I’ve bought a few on sale. The new wave of minifigure scale sets are something else though. I decided to take the plunge and get The First Night, what appeared to be a perfect introductory set. I’ve never played Minecraft. I’m not much of a computer gamer and by the time it was ported to consoles, my interest had waned. The natural connection to Lego is fairly obvious and I followed the development of the minifigure scaled sets, intrigued by the odd building styles that it would present a departure from most everything else out there. Once pictures started to surface for the finalized sets, I was turned off by the design compromises and what looked like a lack of substance. Reading some of the early reviews, I tilted back the other way, interested not only in the new style, but all those interesting colors. With my mind made up, I headed down to my local Lego Store on the release date. What I didn’t know at the time is that these new sets are only available online until next year. I came home empty handed, but an order had been placed on my phone and sets would arrive two days later. The first thing I noticed about this set was the bulk. Because this set has more bricks and large plates than most at the same price point, the box was thick and heavy. Inside, there were three numbered bags, a 8×16 plate, and a thick instruction booklet. 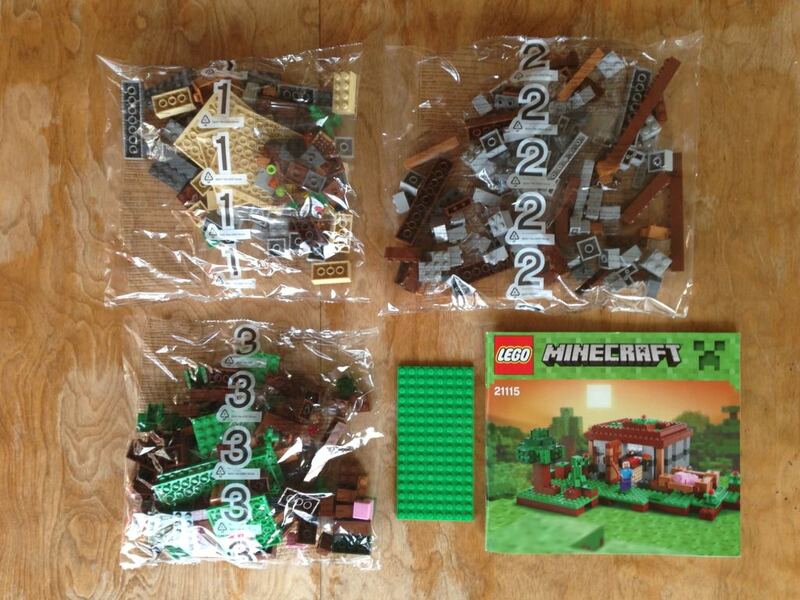 I would come to find that the build is neatly paced across the three bags. Even before opening the bags I was happy to see a great number of large plates and bricks in natural tones. The instruction booklet seems to have a little bit heavier paper than other themes. It is almost too thick to be staple bound, but luckily, that kept it laying flat as I built. The interior layout is clean and simple, the pale, pixelated background a nod to the Minecraft aesthetic. As usual, building the minifigures came first. These guys make up most of the new elements in the set. The new square heads are kind of interesting, but I suspect that they won’t get much use outside of the theme. The pixelated weapons are kind of cool too, though I think that I would have liked to see them in some kind of metallic. 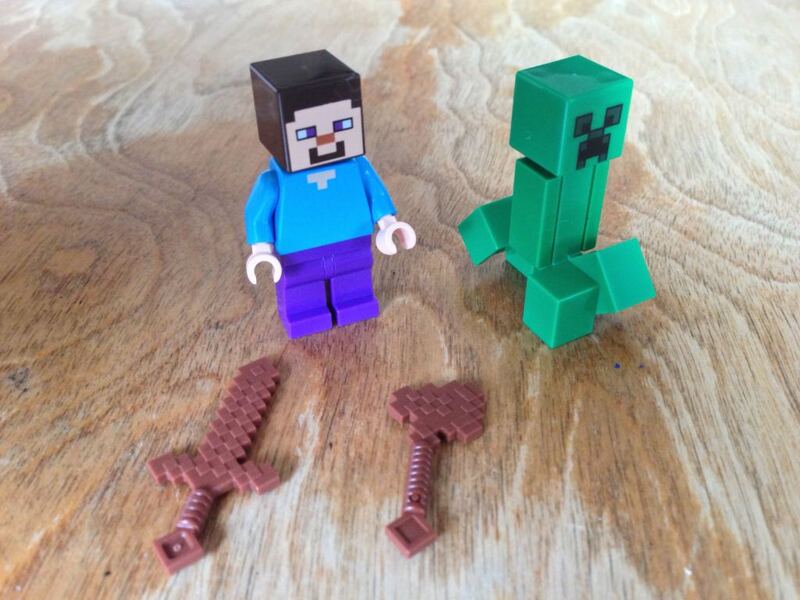 The creeper is the weirdest element though. It’s body is nearly a single piece, with tiles attached to the sides and a neck post for the head. Those strange feet/legs are molded in place, so there isn’t any poseability. The two feet that are raised, though hollow, won’t hold a stud, so I don’t foresee much use for this part either. Time will tell. 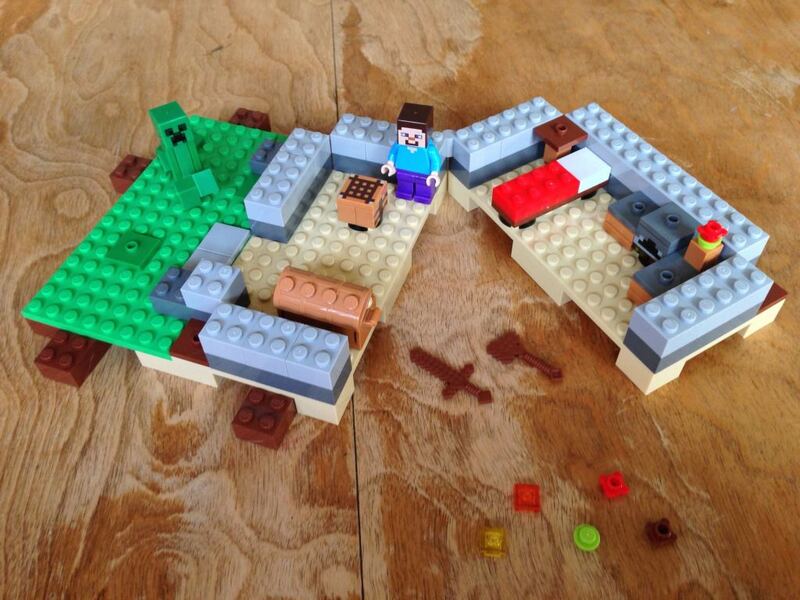 The balance of the first bag builds the lower half of Steve’s (as out main character is named) house. 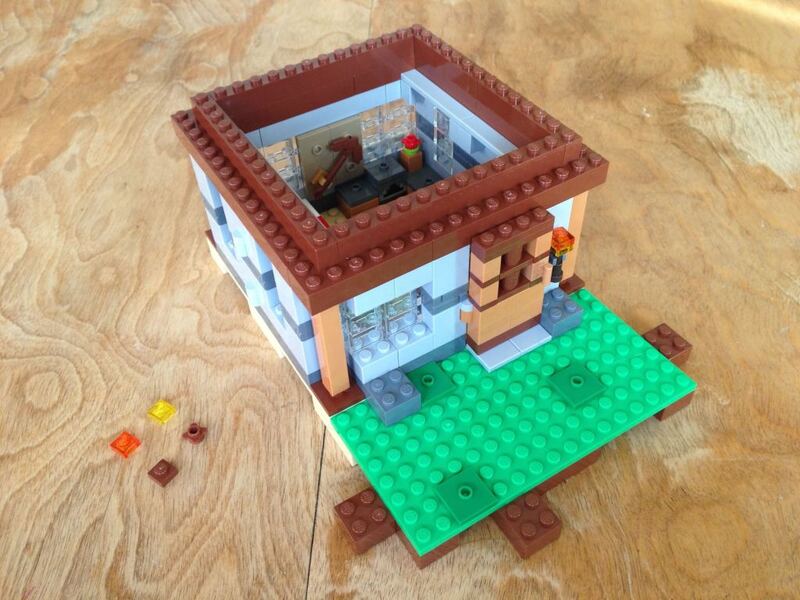 The whole structure hinges open, giving it a dollhouse style playability. The interior is equiped with all of the necessities for our intrepid hero: a chest to store his goods, a crafting table and a forge for making tools and weapons, and a bed for much needed rest. As a someone who grew up with video games, the design language is clear and lovely. The second bag is a bit heaftier and builds the rest of our tiny house’s walls. A tool rack is added to the back wall and a stout door finishes off the modest dwelling. The clear windows built of 1×2 bricks are one of my favorite parts of the house, transparent but pixelated. The building techniques are simple, but an elegant translation from one world of blocks to another. The addition use of color and texture easily elevates what could be little more than a box of stacked bricks into something sturdy and homey. The 1×1 columns in the corners are positioned between studs and float away from the 2x walls. The shadowed gaps bracket the bright brownish color (medium nougat), adding quite a bit to the overall build. 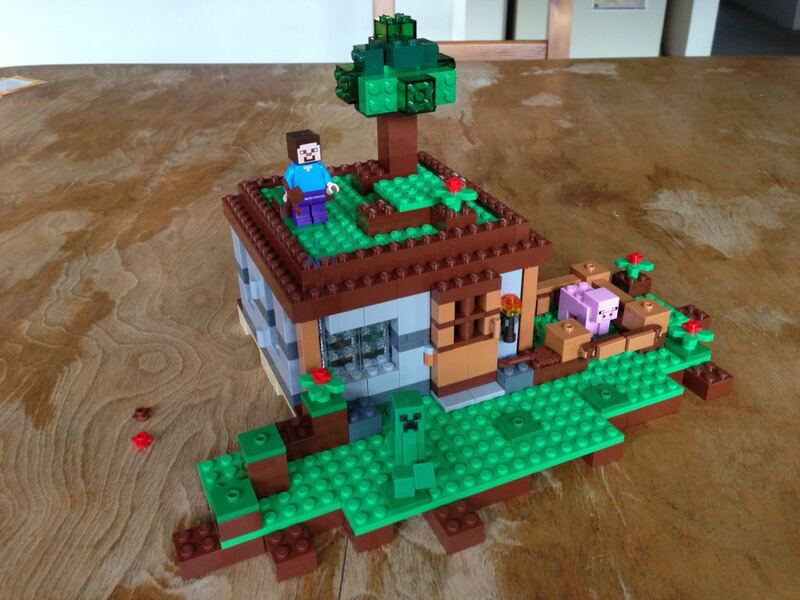 The last bag builds the house’s green roof and expands the outside to include a pig and pen. The chunky tree is a great touch and both roof panels can be used to further expand the land around the house. The house still opens nicely to provide a play area. The balance between play and design may not please some adult fans, but kids are going to find it irresistable. 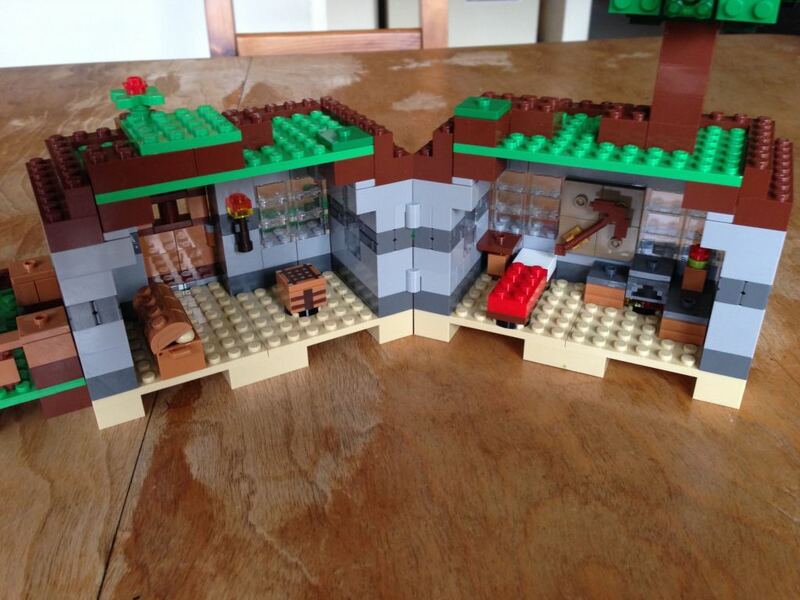 My son built his own copy of this set, taking frequent breaks to play with the unfinished house. Once it was done he spent most of the evening playing with this set. This set does its job perfectly, providing an obvious anchor for exploring the other Minecraft sets. Even more, it could be the perfect doorway for some kids back to playing with Lego, making it more obvious that Lego is first and foremost a toy for the imagination. 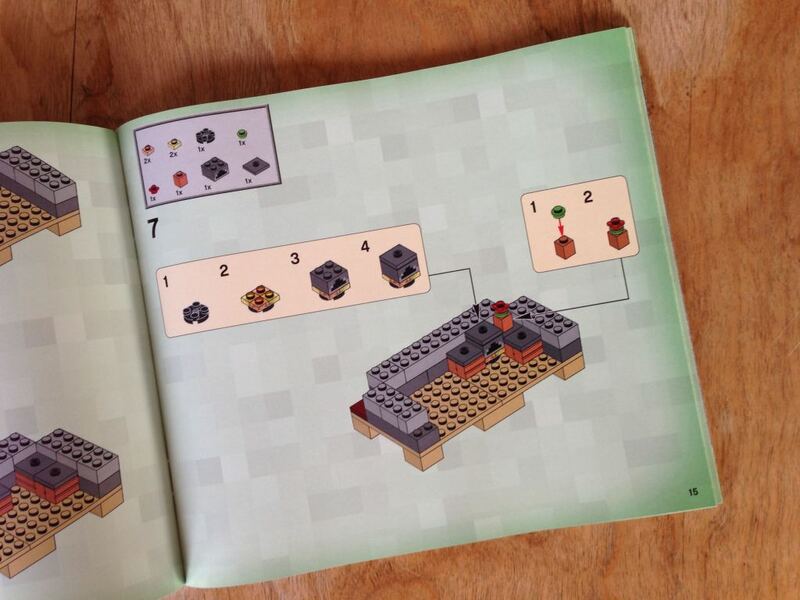 The back of the instruction booklet includes a couple alternate builds to get them started. If you are an adult, you probably already know if this set is interesting to you. It is in the hands of a child that this set will reach is full potential though, acting as a seed for all sorts of imagination play. Honestly, I can’t recommend this one enough.